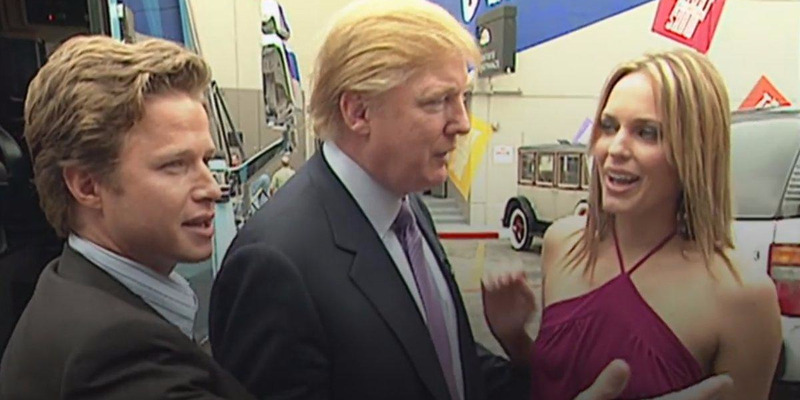 NBCBilly Bush, left, with Donald Trump and the actress Arianne Zucker in an image from the ‘Access Hollywood’ tape. Billy Bush wrote an op-ed article in The New York Times on Sunday in which he condemned President Donald Trump over reports Trump had recently tried to cast doubt on the authenticity of the 2005 “Access Hollywood” tape. The former NBC host Billy Bush wrote a New York Times op-ed article on Sunday in which he condemned President Donald Trump over reports Trump had recently tried to cast doubt on the authenticity of the “Access Hollywood” tape that surfaced shortly before last year’s election. In the 2005 video, a hot mic captured Trump on a bus bragging to Bush, then a host of “Access Hollywood,” about groping women and kissing them without consent. Trump apologised for the comments, dismissing them as “locker-room talk,” when The Washington Post published the video in October 2016. The New York Times recently reported, however, that Trump had changed his story, questioning the authenticity of the tape at least twice since January. NBC fired Bush from “Access Hollywood” and as a cohost of the “Today” show for the enthusiastic way he reacted to Trump’s comments on the tape. “President Trump is currently indulging in some revisionist history, reportedly telling allies, including at least one United States senator, that the voice on the tape is not his. This has hit a raw nerve in me,” Bush wrote. Arianne Zucker, an actress seen greeting Trump in the tape, told CNN’s Anderson Cooper in an interview last week that the tape was authentic. Bush wrote that at the time he assumed Trump’s comments on the bus were “hypothetical hot air from America’s highest-rated bloviator” but that years later, after several women accused Trump of sexual assault before the 2016 election, he had changed his view. Bush also argued that his participation in the vulgar dialogue on the bus was part of a wider practice at NBC of accommodating Trump at all costs. NBC was the network behind Trump’s show “The Apprentice,” which began airing in 2004. “Was I acting out of self-interest? You bet I was. Was I alone? Far from it,” Bush wrote. “With Mr. Trump’s outsized viewership back in 2005, everybody from Billy Bush on up to the top brass on the 52nd floor had to stroke the ego of the big cash cow along the way to higher earnings.